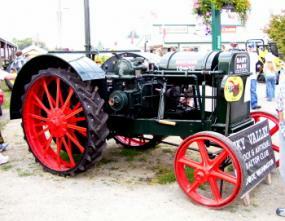 Steam-powered antique tractors, as well as those run by internal combustion engines, have become increasingly popular. Enthusiasts now restore and study the history of old farm tractors similar to the attention spent on antique cars. Antique farm tractors are no longer relegated to a small section of the fair or car show. In the late 19th century, farm tractors such as those manufactured by the J.I. Case company, were powered by steam engines. Early steam tractors pulled plows and threshing machines and could hook up to the thresher by belts to power it. They were also called traction engines because they were steam-powered locomotives that didn't run on rails. These large, bulky machines with bin and boiler and huge metal wheels, often too heavy to drive over soft ground, were unwieldy. The advent of the internal combustion engine attracted many companies attempting to manufacture successful gasoline-powered tractors. In 1892, John Froelich (1849-1933) invented arguably the first gasoline-powered tractor. John Deere, a successful plow designer looking for a reliable internal combustion tractor to enter the field, purchased Froelick's Waterloo Gasoline Traction Engine Company. Tractors have always been important around the farm. In 1831, Cyrus McCormick (1809-1884) invented the mechanical reaper or harvester that cut wheat like a sickle but was pulled by a horse. A binder was later invented that bound the stalks into bundles or sheaves. Threshing machines separated the grain from the stalks and husk, but the invention of the combine harvester now did the threshing and the reaping. Early combines were sometimes hitched to a team of 30 or more horses. Steam and gasoline tractors pulled the combines before they became self-propelled. In the early days of internal combustion tractors, there were hundreds of companies, many of which failed. These tractors, along with the steam-driven machines, are now of great interest. Jerome Increase Case (1819-1891) was an early manufacture of steam-powered tractors. His company, the J. I. Case Company, later produced internal combustion tractors. John Deere (1804-1886) founded the John Deere Tractor Company, at one time the largest manufacture of agriculture equipment in the United States. Everyone is familiar with the green John Deere lawn tractors of today. These early internal combustion engine tractors were very popular and manufactured by the International Harvester company. Fordson tractors, from Henry Ford (1863-1947) the automobile manufacturer, competed with Farmall tractors. Some museums solely display antique tractors, while others show them as part of antique farm equipment exhibits. Yesterday's Tractor Co. website has a guide to museums that have antique tractors as well as a guide to antique tractor shows. Information about tractor parts, operating manuals, and restoring antique tractors can be found at many websites and forums. There are also antique tractor and farm machinery magazines and an increasing number of books on the early history of tractor companies. Items such as cast-iron tractor seats and sale brochures about steam engines are collectable. Beginning in the early 1900s, tractor companies hired toy manufacturers to produce replicas of their tractors. These cast-iron models, created when mining iron ore was common, can be valuable too. Antique tractors remind people of a simpler time. While not everyone can collect and display full size tractors, most people enjoy looking at them and learning about their history. They remind us not to take modern conveniences for granted!